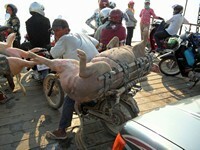 We had to bribe Vietnamese officials to let us out of Vietnam at a rate exceeding one person every 15 minutes. 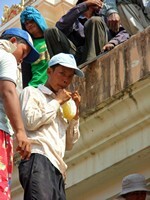 Once in Cambodia we saw a more friendly sight of a trader selling bags of frozen tea to workmen on the roof. 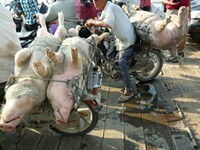 In the course of our journey to Phnom Penh we saw some live pigs on mororcycles. 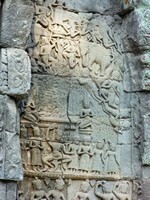 They were carried on specially-built racks. 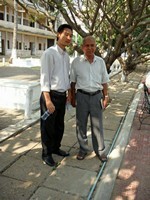 In the morning we visited the Tuol Sleng Genocide Museum. The man on the right is one of the very few people to have survived his stay in the building. 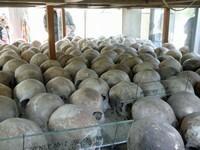 Later we visited the "Killing Fields" of Cheoung Ek. 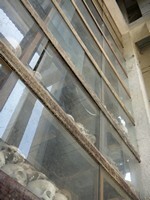 This is the memorial building full of skulls of the victims. 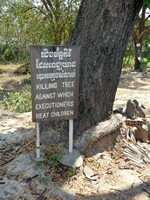 Here, nearby, is a tree used to dash children to death. 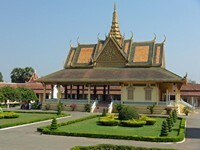 ...to the Royal Palace in Phnom Penh. 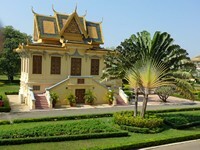 A party of monks in the grounds of the palace. 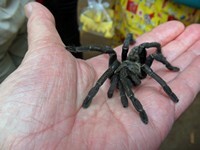 During a coffee stop I was introduced to a Tarantula by its owner. Nearby they were selling fried Tarantulas! 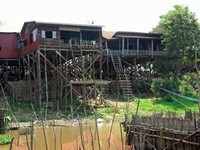 We broke our journey to board a boat and head downstream past villages on stilts to reach Tonle Sap Lake. 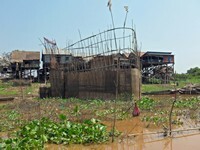 There we saw the floating village of Chong Kneas and sights like its floating school. We spent rather a long time in the area when our boat engine refused to start. Eventually the engine was re-started and we headed back upstream. 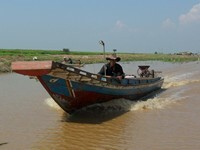 There was plenty to see in the form of local waterborne traffic. Back on land, there were still a few interesting sights to see. 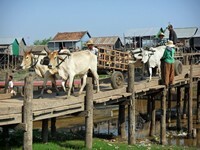 Doubtless, we were an interesting sight for the locals! 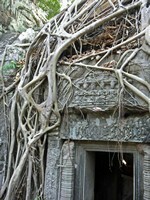 08 March - The "Jungle Temple"
This is one of the first photos I took on seeing the temples of Cambodia. 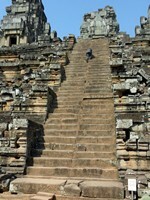 Immediately it shows the quality of workmanship of those who constructed the temples. 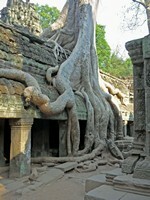 The Ta Prohm temple site has only been moderately tidied and shows how the jungle had overrun the temples. It was easily the best part of our visit. 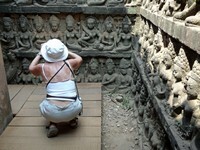 Sunsequently we found ourselves wishing that the other sites had not been so dutifully restored! 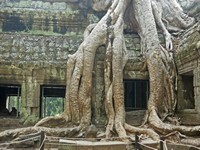 Seeing the huge trees wrapped around the buildings is a very moving experience. 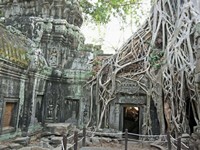 From there we moved on to the Ta Keo site, which had been restored. As you can see, it is an interesting site for the visitor. 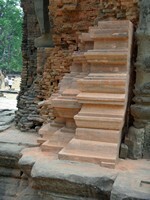 In the left photo you can see the staircase in context. 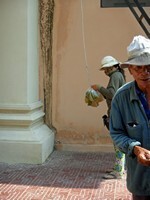 The right photo shows some of the well-meaning "restoration". 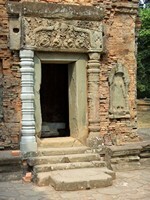 Many of the buildings are still in excellent condition. 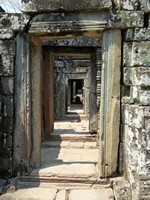 See how well the doorways line up. 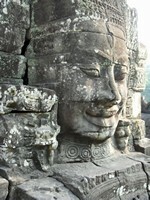 A large sculpture in the Bayon site. 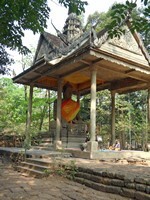 A well looked after statue and an attendant monk. 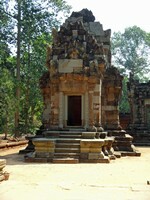 Adjacent to Wat Preah Ngok. 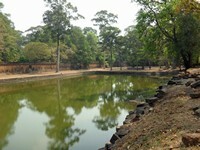 An artificial lake some 600m N or Bayon. 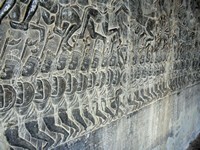 A sculpted frieze in the Leper King Terrace. Small statues this time - unlike the big one earlier in the day. We have very mixed feelings about such restoration. In small amounts it lets you understand how things would have looked originally. It is important not to do so too extensively - leading to a sort of "pantomime horse" effect! As in all tourist areas, you are apt to be followed by anxious souvenir sellers. 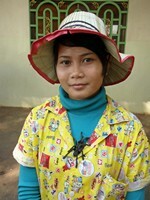 Both Vietnam and Cambodia are reasonable in this repect; unlike say India or Morocco. This is the site whose name everyone knows. 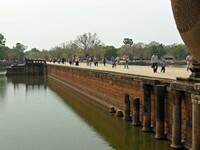 Surrounded by a huge moat, which is crossed by a magnificent causeway. 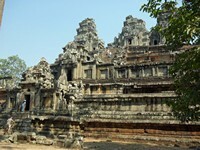 The main building is most impressive in its scale. 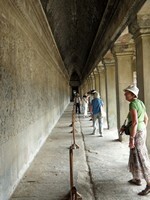 It is bounded by four walls - each 100m long and covered in fine sculpture. Aesthetically, I would describe it as "a barracks with five large pineapples". Even so, climbing up its side is impressive. 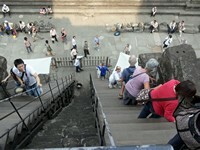 To see the layout of the whole site, click here for the services of Picasa.